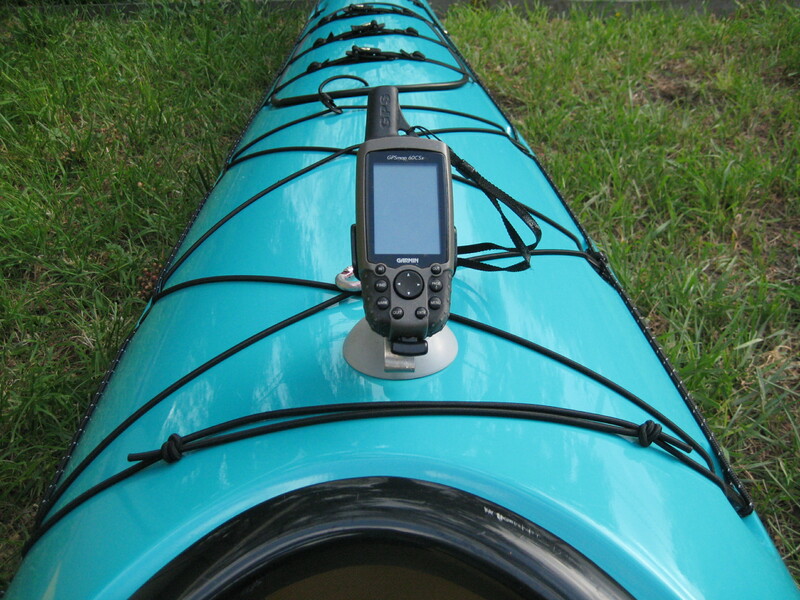 I promised I’d post a picture of my GPS attached to my kayak. 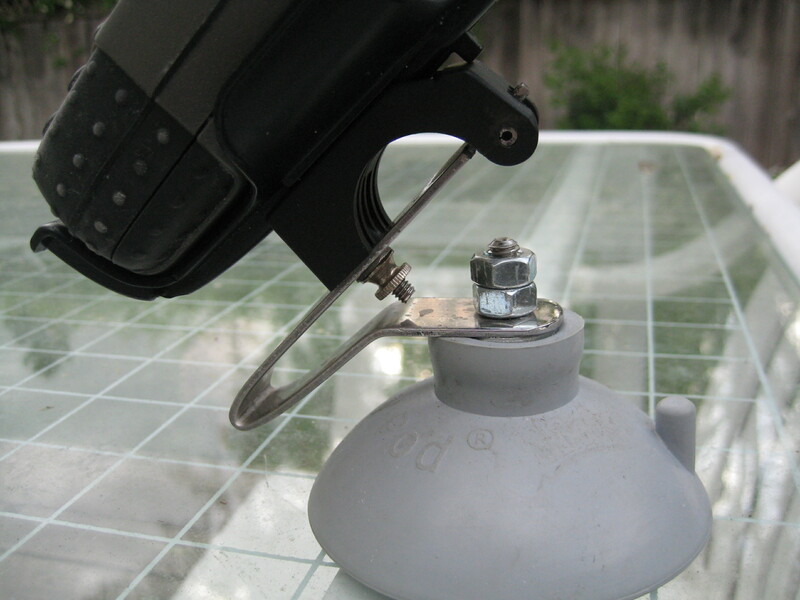 The actual contact between boat and equipment is an industrial suction cup (actually made for cameras) called a Sticky Pod. It was only $5, and there’s other models if you want something more elaborate. I work in the trades and a colleague (thanks Johnny) fashioned an attachment with stainless steel (very light and doesn’t rust) and a bike mount for my specific GPS (Garmin GPS Maps 60csx). I can detach the GPS with a release button on the bike mount ; the bracket which holds the GPS comes off in a second. I had my test run last Thurs. and all worked well. I did tether it all to my kayak, in case. I could barely get it off at the end of the day, so I’m pretty confident it’s going to stay attached (if you follow the instructions). A GPS is on the recommended list of equipment for the race (CR100). So this is something I will be practicing with. I also use the Forerunner 305 because I’m working out with the heart rate monitor. The Forerunner gives current speed (and others), which I really like. Whereas the 60csx shows averages and maximums. I’ve compared the two for distances and I’m happy to say they’re very close to each other. I’d love to take the Forerunner to the race but the battery won’t last that long and you can only charge it through it’s stand directly from an outlet. Both GPS are rated IPX7, so I’m not too worried about the water. A good rinse and dry after each paddle and I should be OK. Another paddler who wrote an article about using the Forerunner for training in a kayak mentioned the metal contacts on the back of the Forerunner and salt water. He suggested putting some kind of lubricant there. I’ll have to look into that more. Here’s the 60csx on the deck. I don’t actually have the suction cup engaged here so it would still sit a little lower. I also put it right at the first deck line from the cockpit. I then attach the Forerunner via the wristband to the deck line. You can’t see the tether here, but I also attached a carabiner to the wristband of the 60csx to a deckline. I’m thinking of using another sticky pod for the bow light. We don’t require one for navigation, but I know there’s no moon for the race. Many racers are using headlamps. I think I will for what I might need to see in the cockpit or while I’m on land at night. But there’s lots of talk of bugs and I don’t want them flying all around my face while I’m paddling. There’s a Finex flashlight with about 50-60 lumens that runs on batteries for 10 hours. I’m probably going to use this at night to help me navigate. I think the only other modifications I’ll be making is somehow suspending my water bag (4L) behind my seat, and possibly a deck bag which can also be suspended under the deck. It’s made by North Water. I believe sandybottom used it in the Everglades Challenge. I’m waiting for her reply as to how successful it’s use was. This entry was posted on April 11, 2010 by DummyDiva. It was filed under Uncategorized and was tagged with Colorado 100, equipment, Everglades Challenge, Finex, flashlight, Forerunner 305, Garmin, GPS, heart rate monitor, North Water, Sticky Pod.